A digital servo press includes the same components as the high-end actuator. However, it also features a controller, signal amplifiers, and active motor cooling with dedicated software to provide true closed-loop control of both position and force. The press's drive and mechanism varies, depending on model. Mechanism types include rack-and-pinion, planetary roller screw (for higher forces), and ballscrew. The presses can be driven directly through a gearbox or by the servomotor. The digital control of the servo press enables harmonic movements of various devices such as hydraulic, air, and servomotor controlled cushions with the main slide. By utilizing this function, servo presses are often employed to extend the forming limit and to improve product accuracy. On a multi-axis servo press, two or more processes may be completed in a stroke by moving the driving axes cooperatively. Conventional presses usually employ a flywheel that is connected to the main gear via a clutch brake. Therefore, considerable attention has been paid to the on/off operation of the clutch brake. For most servo presses the energy is directly transmitted resulting in an overrun of the servo-motor which directly leads to an overrun of the slide’s motion. Thus, additional digital control becomes necessary for safety reasons. To avoid errors in position sensing, multiple position measuring is employed in the digital servo press, combining absolute slide position sensors, and pulse coders. Further redundant control loops are employed in digital servo press to avoid incorrect outputs. One of the major challenges affecting the growth of the digital servo press market is high initial cost and requirement of skilled professionals for the manufacturing process. Digital servo press is gaining traction in the market due to its ability of performing tasks with efficiency and accuracy on account of its flexibility of speed, controllability, and simplicity in design. However, skilled personnel are required for their operations to maintain productivity in the machine process. Furthermore, high initial investment is required to set up the entire production process with servo press in the manufacturing process, thus becoming a challenge for servo press manufacturers and for its market growth across the globe. Further, there are various challenges in the manufacturing of the presses such as the continuous increasing information about the trends of stamping equipment development, and integration of downstream and upstream industry resources to provide optimal production programs and assist customers with profitable production in order to create a win-win situation. However, it is anticipated that cost reduction due to the emergence of price-based competition and further technological advancements in digital servo press would lead to an increase in demand for digital servo press. Growing manufacturing sector in the Asia Pacific region and strict vehicle emission regulations are the key factors anticipated to create good growth opportunity for digital servo press manufacturers. Increasing focus of consumers on improving the productivity with improving global gross domestic product (GDP) growth, stabilizing various commodity prices such as crude oil, and rising passenger travel demand majorly in Asia Pacific is likely to drive the market for aircrafts in the region. Furthermore, the global Aerospace & Defense (A&D) market forecast by Airbus suggests that the Asia Pacific region will lead world traffic by 2036, with a threefold increase in traffic by the end of the forecast period. This in turn is anticipated to enhance aerospace manufacturing further, thus positively impacting the market for servo press manufacturers. Additionally, as regulations for emission control have become strict throughout the world, the utilization of lightweight materials such as aluminum is growing in order to reduce the weight of automobile bodies. Growing consumer adoption of plug-in hybrid vehicles (PHVs) and electric vehicles (EVs) is one of the key factors supporting the manufacturers. In order to design lightweight products, automotive OEMs are accelerating the adoption of aluminum and high tensile strength steel, which in turn is projected to propel the demand for servo press and create significant growth opportunities for manufacturers of servo press across various geographies. 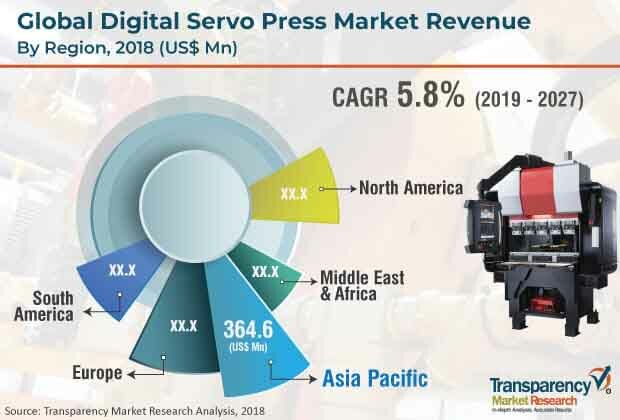 Some of the key players profiled in the global digital servo press market are FEC Inc., Dai-ichi Dentsu Ltd., Hoden Seimitsu Kako Kenkyusho Co.,Ltd., AMADA MACHINE TOOLS CO., LTD., Promess Incorporated, Sanyo Machine Works Ltd, C&M Robotics Co, .Ltd., Stamtec, Inc., Komatsu America Industries LLC, Coretec, Inc., and Janome Industrial Equipment.